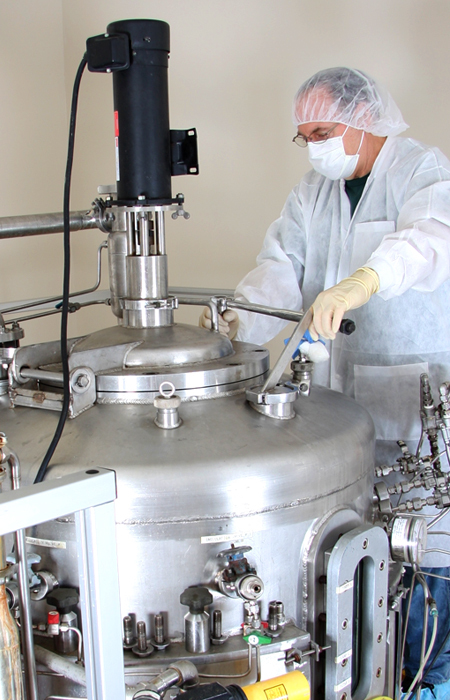 EKF Life Sciences’ contract fermentation facilities are designed to produce micro-organisms, including recombinant organisms, for clinically important enzymes and proteins used in many industrial applications. EKF Life Sciences contract fermentation enzymes are either sold in bulk or used in the production of in vitro diagnostic devices (IVDs). Our experienced team, which has nearly 100 years’ of working in life sciences, ensures that customers receive a high level of capability and expertise in each and every project. A free standing 40 liter scale up/seed vessel that is capable of routine working volumes of between 10-30 L. The vessel is semi-automatically controlled and monitored for temperature, pH, Dissolved Oxygen and Optical Density. It can be used for small scale production, a testing platform for scale up and protocol optimization, or as a seed build tank for our larger production vessels. A free standing 80 liter scale up/seed vessel that is capable of routine working volumes of between 30-60 L. The vessel is semi-automatically controlled and monitored for temperature, pH, Dissolved Oxygen and Optical Density. It can be used for small scale production, a testing platform for scale up and protocol optimization, or as a seed build tank for our larger production vessels. A separate 250 L production vessel with working volumes of between 60-200 L is available for contract applications. This vessel is ideal for small multiple batch production runs where final customers may be emerging niche markets with an initial limited distribution. The 250 L vessel is manually controlled and monitored for temperature, pH, Dissolved Oxygen and Optical Density. Customers also request the 250 L vessel when requiring larger volumes of working material to de-risk and adapt their proprietary laboratory scale downstream process to a more robust production protocol needed for large scale commercialization of their product. The 1,600 L production vessel has working volumes of between 500-1,400 L. The vessel is configured in a production module which includes an 80 L acid addition make-up tank, an 80 L base addition make-up tank, a 16 L auxiliary tank for miscellaneous additions, the 1,600 L batch fermentor tank, and the PLC controller module for automated control and monitoring of the fermentation run. The design of the PLC controller allows for automated cascading of aeration, agitation, and vessel pressure and to control % Dissolved Oxygen at a specified range. The PLC controller is flexibly designed to allow for custom configurations of a given client’s control scheme and production protocol. CO2 off-gas measurements can also be provided for clients requesting a more detailed profile of a specific organism’s metabolism. The 1,600 L vessel is the ideal pilot plant and medium scale production or de-risking vessel. The PLC controller can program process parameters and subsequently capture process data for batch records and reports. The controller’s advanced software also provides real time graphic representation of the fermentation process and results. Cost efficiencies of batch processing and the commercial scalability of protocols for large scale industrial products can be optimized when using a 1,600 L vessel. It is ideal for pilot scale protocols and it is routinely used for medium volume production of material for various commercial applications.